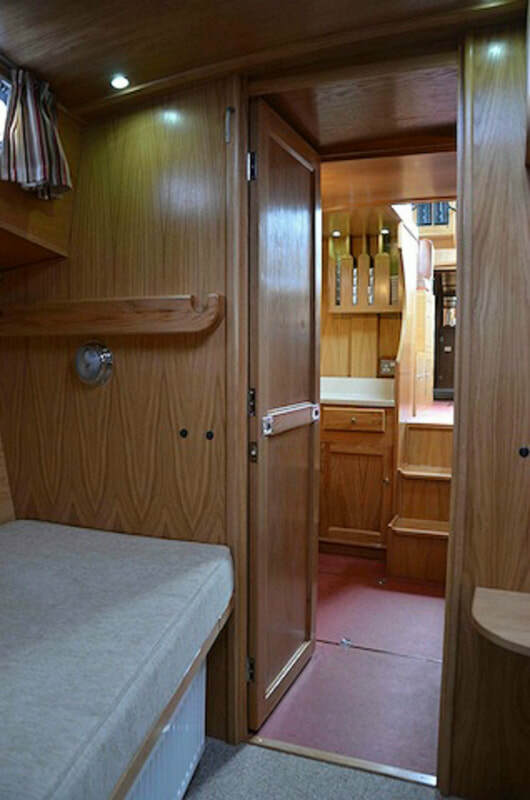 The Huffler 35 and Huffler 40 steel motor sailer, was built with more than an eye to the best that tradition has to offer and offers the very best in steel boats. 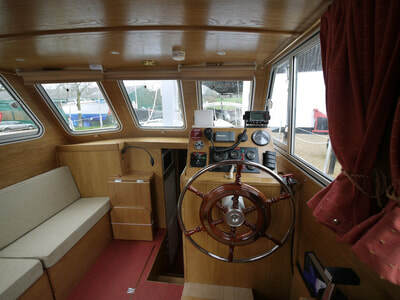 The sailing version combines the joy, excitement and grace of sailing, with the comfort and security of a motor vessel. 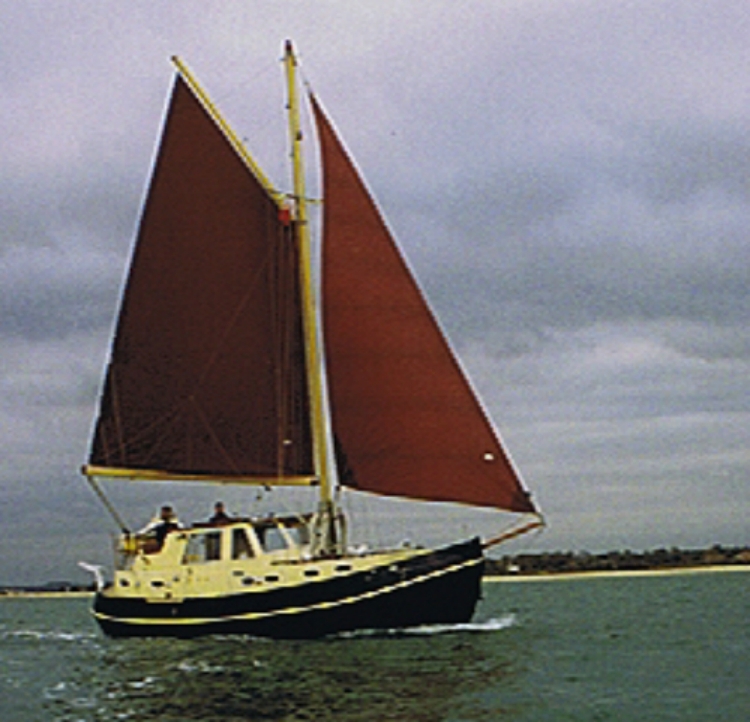 The Huffler was designed specifically for Peter Nicholls by the well-respected yacht designer Tony Tucker. 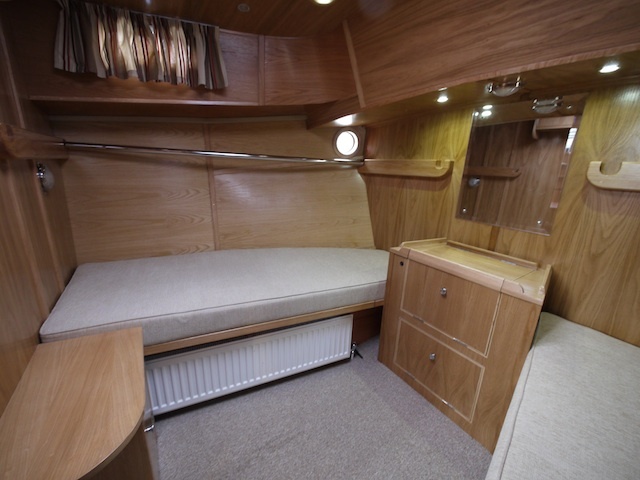 Whether you wish to cruise Britain and Ireland, or intend to venture further afield to cruise Europe the Mediterranean and Scandinavia, the Huffler does it all in style and comfort. The Huffler’s shallow draft, with a raised keel, and self lowered mast allows the exploration of the many and varied shallow creeks, rivers and canals of Great Britain and Europe and beyond. 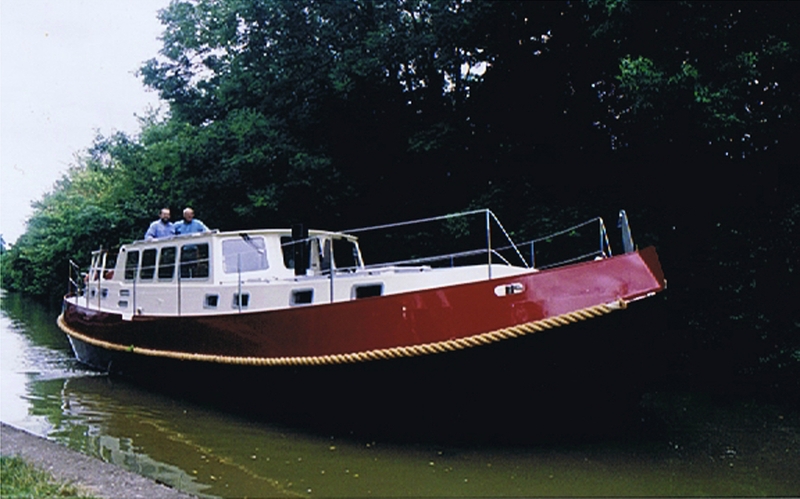 A bilge keel version was designed in 2013. The sailing Huffler is built to the highest category (A) of the EU Recreational Craft Directive, the motor version is category B. 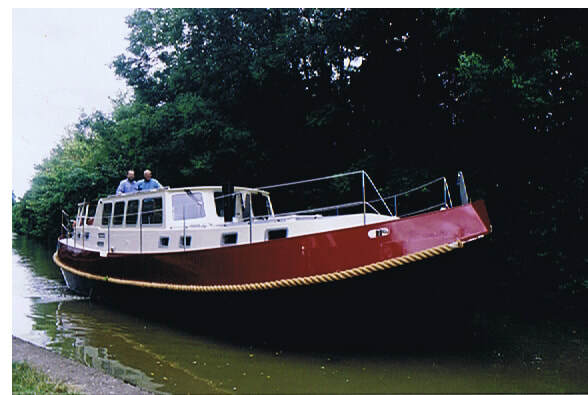 This Motor Sailer has a chined hull and is robustly constructed from thicker than average steel plate which is protected by a state of the art epoxy paint plan. The dual steering position gives the comfort of a wheelhouse/ saloon in bad weather with the advantage of an open steering position on a sun deck. 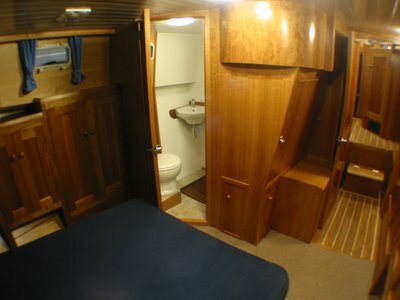 ​There is also a cockpit well option with double berth under. 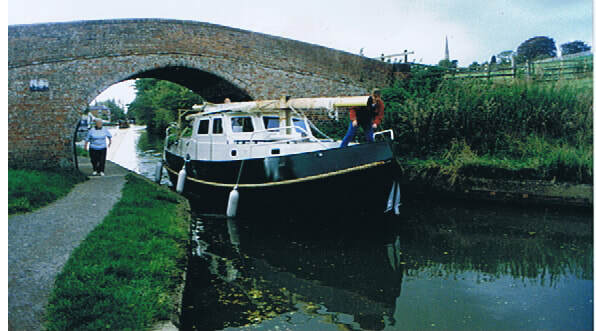 At sea, the Huffler’s sea-kindly hull shape provides an easy motion which makes her popular with all members of the crew. Her sailing performance is surprising considering her shallow draft and low aspect rig. Off wind, she eats up the miles with an easy motion and performs moderately well to windward, for a boat of her type. 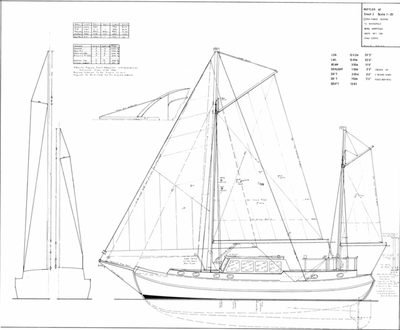 The gaff rig and deck layout have been designed for easy and safe handling and single-handed sailing. 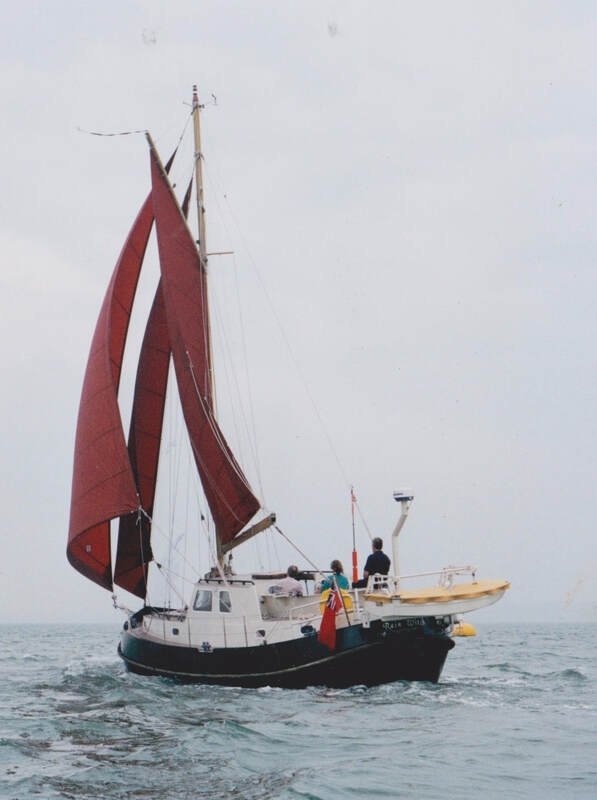 This has been a priority using a self-tacking, furling headsail with a slab reefed mainsail which drops into lazy jacks. 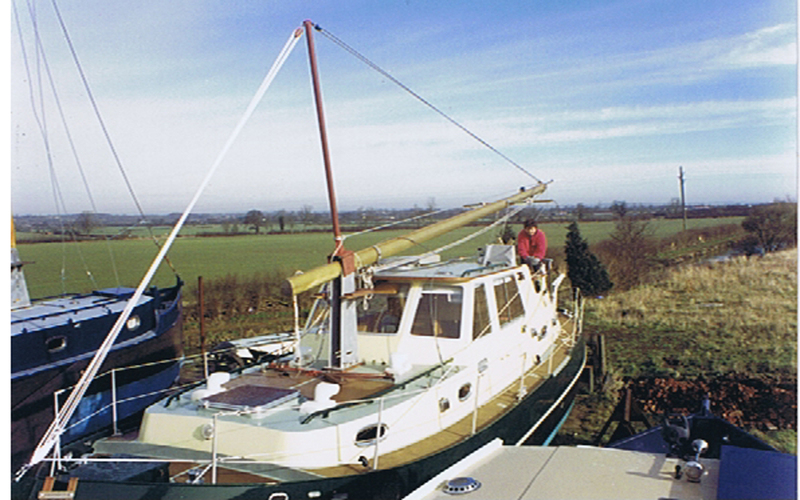 Aluminium spars are used to keep weight low and minimize maintenance, with a specially designed stainless steel gaff carriage. Despite her seemingly bluff bow, the Huffler motor sailer does not slam into waves under sail or power, but lifts and rides over the crests with an easy motion. She is a true seagoing ship. The Huffler has undergone much development since the first Huffler was built in 1993 and subsequently exhibited at the London and Southampton Boat Shows. On the sailing version, the sail area has not increased over the years, and the speed under sail has increased. In the summer of 2014 our latest Huffler 35 left Grimsby on a Tuesday afternoon in August and reached Port Edgar Marina, west of Edinburgh, on the following Friday at 10 am. This with one overnight stop. Conditions were force 3 to 5 wind, wind direction “not ideal”. We were surprised to hear from the owner on the Friday morning that he had just arrived. In 2000 the first Huffler 40 was built and the Huffler 56 was introduced in 2010. 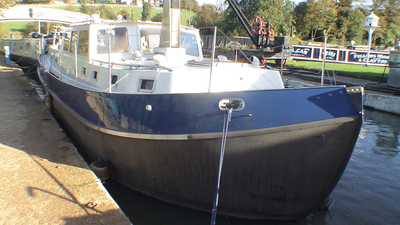 You can come and see a Huffler 56 in build now at our works in Braunston. Give us a ring on 01788 891 823 to arrange a viewing, or book an appointment. 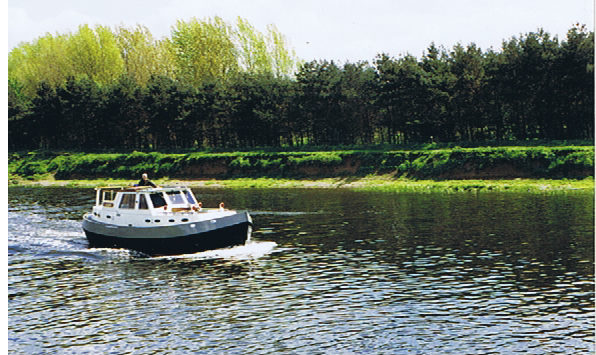 Showing the full versatility of the Huffler: Rainwitch, built in 1998 is equally happy on the open sea or an inland waterway, with keel raised and mast lowered. Rainwitch subsequently cruised to the Baltic, Berlin and Brittany. 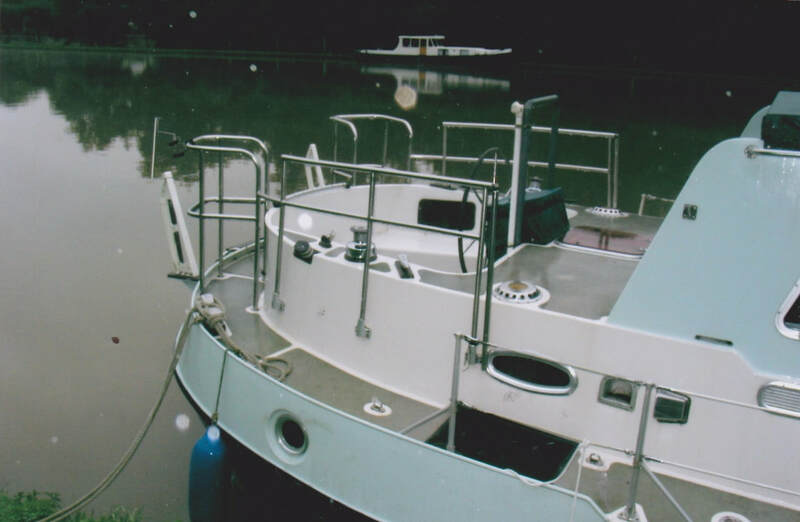 The first 40ft Huffler motor yacht was completed in 2001, Certified B category RCD she is ideal to cruise Europe both inland and at sea, from Ireland to the Mediterranean and all stops on the way. 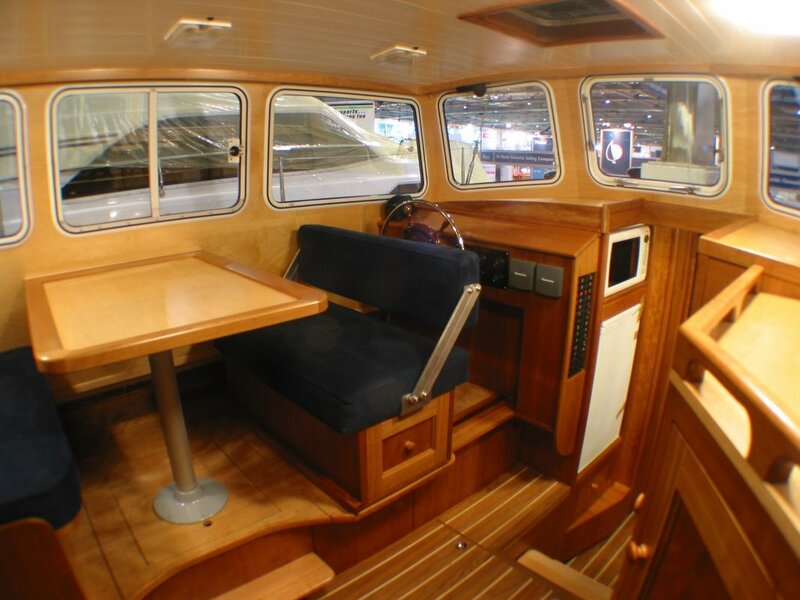 A very roomy liveaboard seaworthy motor cruiser. 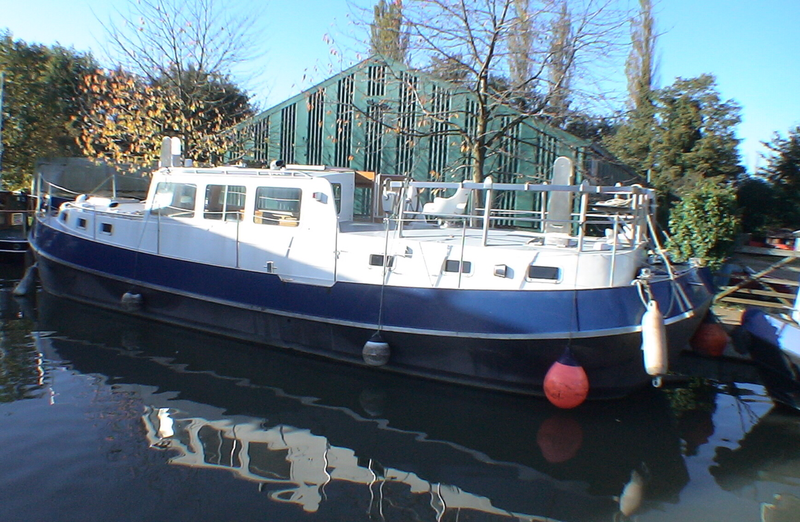 Huffler 35 motor yacht Cobweb was built in 1996 and fitted out by another company She was built for retirement and the owners till have her. 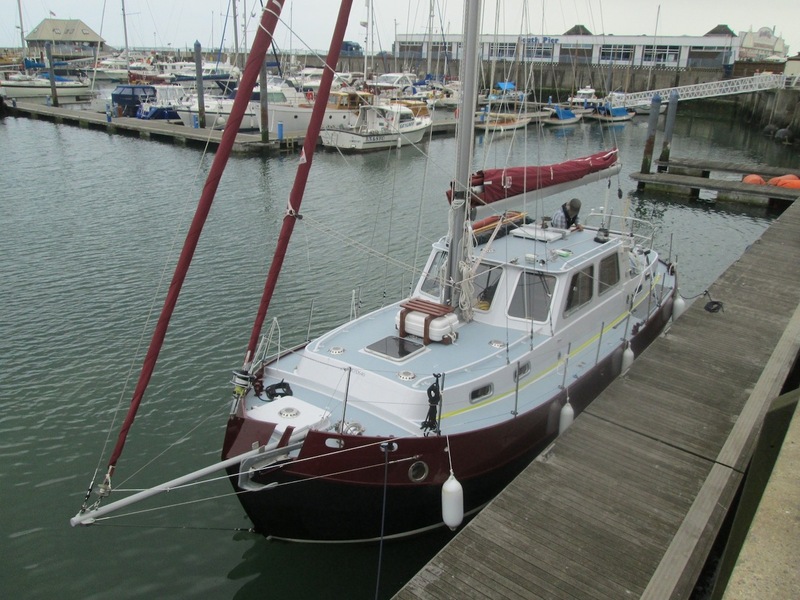 From their base on the Suffolk coast have made long range liveaboard voyages through and around the coasts of Europe and Scandinavia. The Hufflers are gaff rigged. 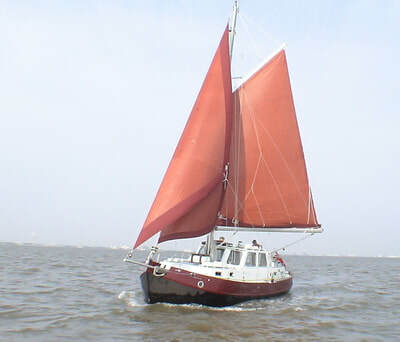 Standard is two headsails, one furling a slab reefed main. Though there are other options. 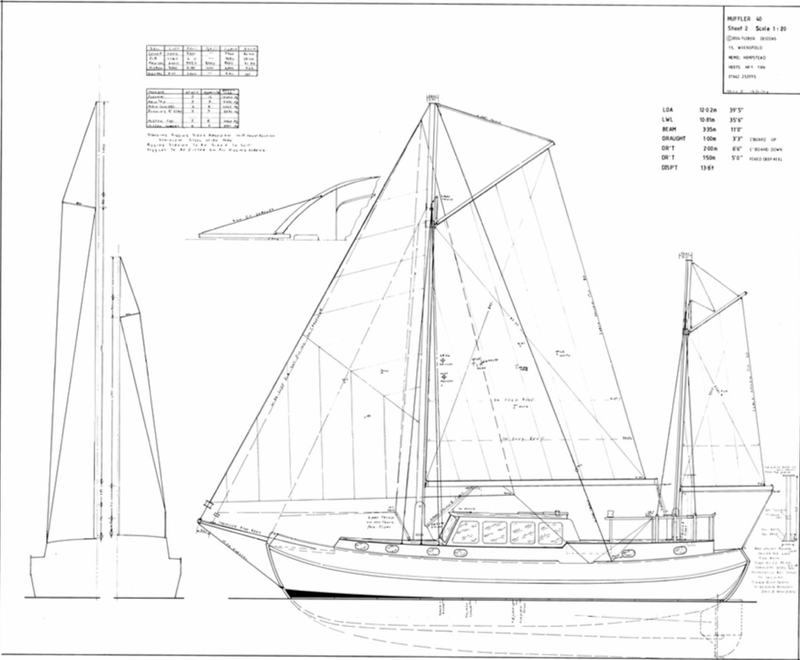 The Huffler 40 can be twin masted with a ketch rig. 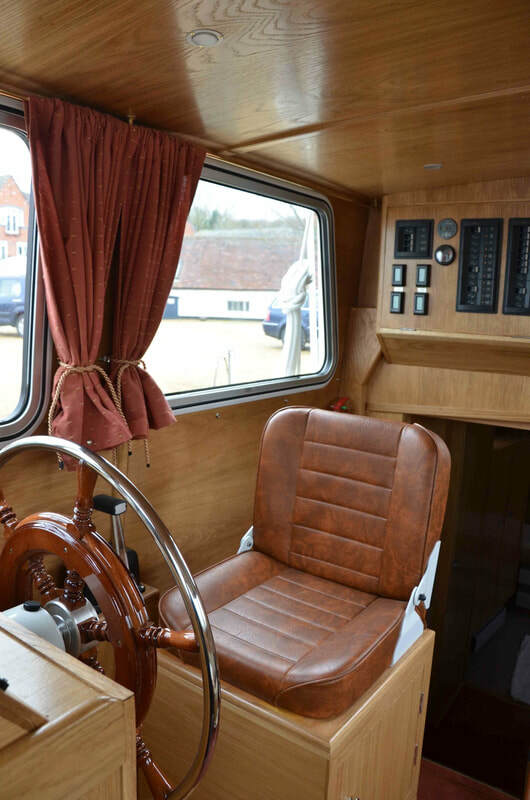 Great attention is taken with the quality and design of the rig and its constituent parts with sail from Jeckells of Wroxham, winches by Andersen and blocks from Lewmar and Barton. Diesel engines in the 70 to 85 hp range are standard, driving direct or through a hydraulic drive. 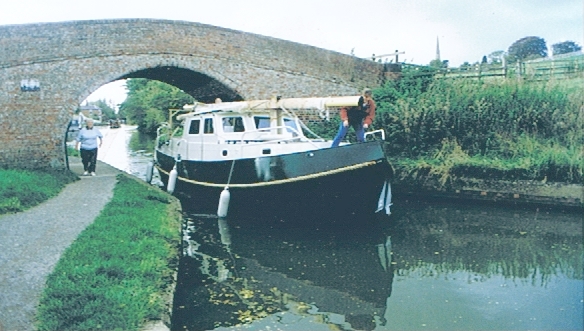 A bow thruster is standard equipment for manoeuvrability in tight situations. Much attention is paid to ease of maintenance and reliability which is essential for safety and enjoyment. The Hufflers are designed with owner maintenance in mind. A 24-volt system is standard for the domestic side with 12 volts kept for engine start and any other owner requirements. 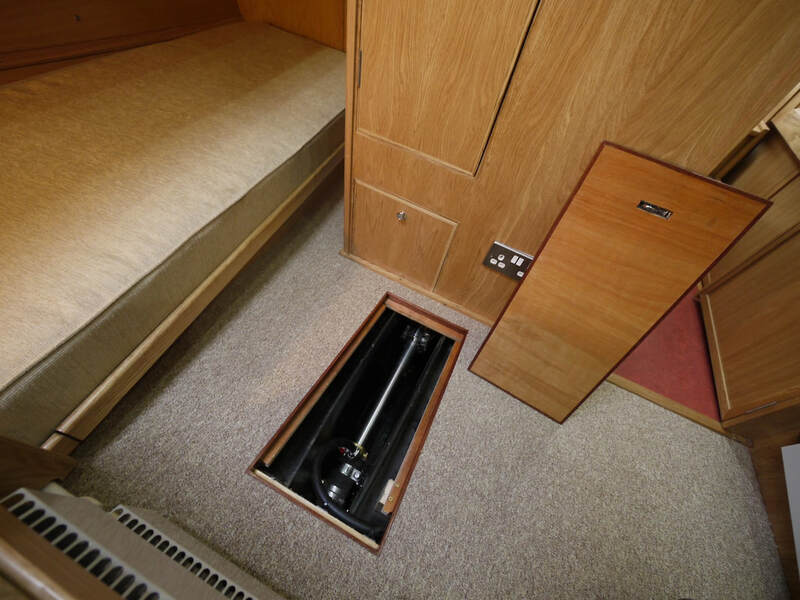 Absorbed glass mat batteries are standard for the domestics. There is enough battery capacity, in conjunction with the twin alternator system, to comfortably run 240 volts without the need for a separate generator. Even a washing machines and even a tumble drier (if required). LED lighting is used where possible to lower the demands on the batteries. Down below the Huffler is a true home from home and is built with serious long-term cruising in mind. This to a level associated with much larger vessels. The use of natural hardwoods and hardwood veneers makes for a hand built interior of superb quality that will not date. Proper varnish is applied by hand. In later years this can simply be brought up fresh with a quick sand and re-varnish. No sprayed lacquers are used. 40 years of continuous production provides a wealth of experience and the ethos has not changed. The Hufflersare built and fitted out with a great attention to detail in the design, workmanship and choice of materials used. While we keep abreast of modern developments, the Hufflers do not date. Most are still in original hands and are still offering the same amount of pleasure and fulfilment as the day they were launched. The large forward cabin is a sleeping cabin with proper sized single berths around 3ft wide across the head end. Pipe cots above for youngsters are an option. 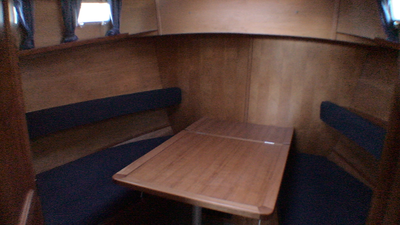 Alternatively, this cabin can be more of a dining saloon with fold up table but still with the same sleeping accommodation. 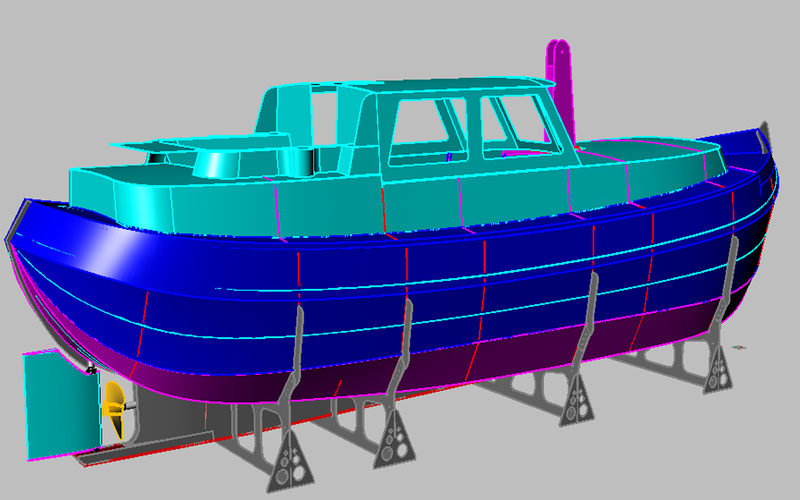 There is a large fo’castle forward with deck hatch and separated by a watertight bulkhead. 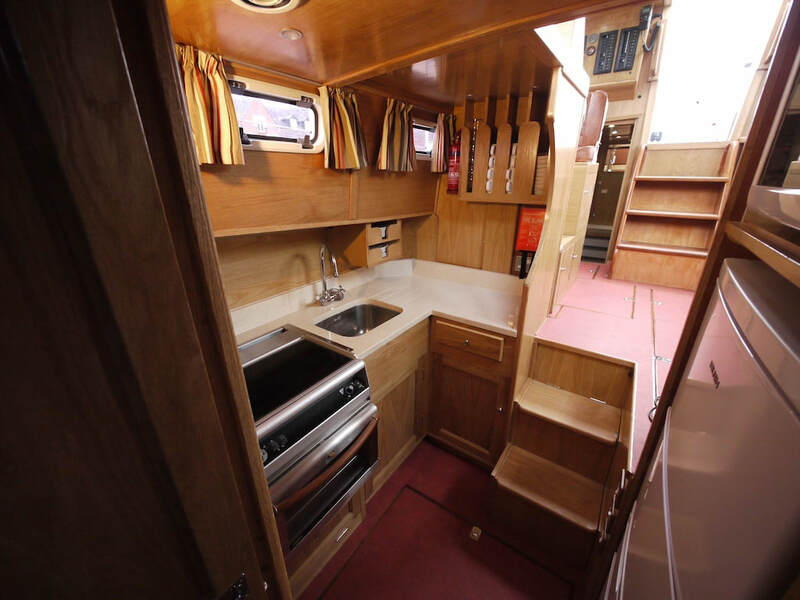 The galley: Leading from the bow cabin, the galley is compact and well appointed with storage built in for crockery (supplied to fit) granite worktop and even a handy waste bin under a step to keep the area tidy. Cooking is by diesel or gas with a good sized fridge/freezer and microwave opposite. 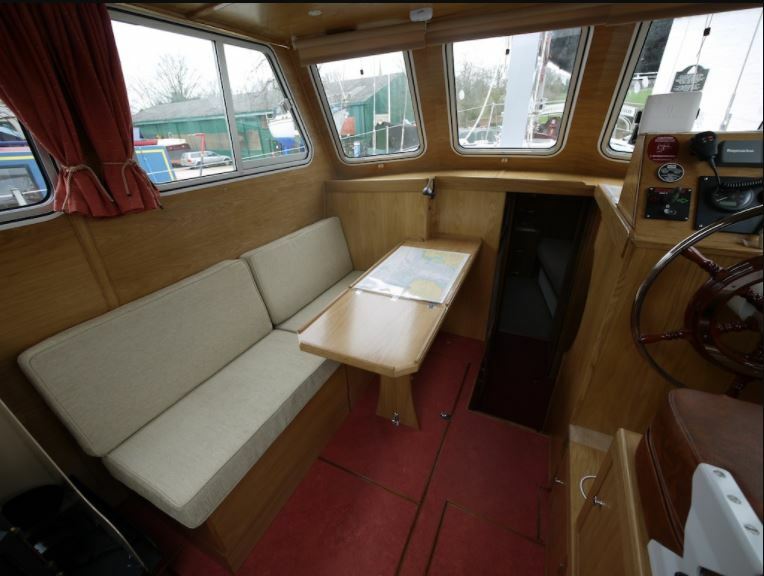 The wheelhouse/saloon has the second steering position and variations including U shaped settee, bench settee with dining table and charts A recent customer persuaded us to fit a secondary heating system by way of a solid fuel stove. This works well as a secondary heat source and is quite safe with simple precautions. 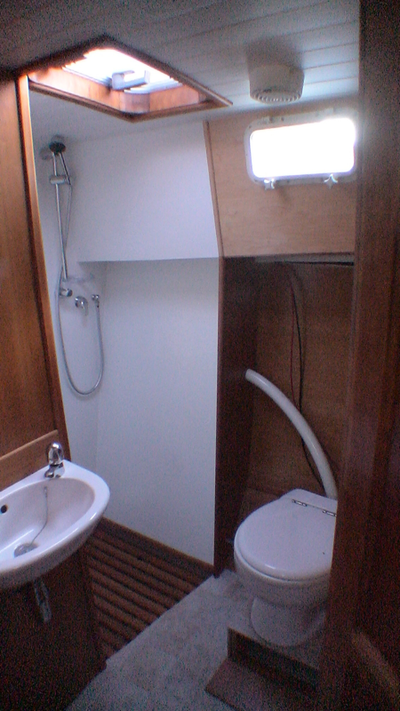 The aft cabin has the second bathroom , a good sized double berth and writing desk. Or with a sunken cockpit well, there can be two single berths. Alternatively, there can be a cockpit well to the stern , with a good double sitting nicely across the boat and under the foot well. A washing machine can be fitted in this area. Click here to open the designer Tony Tucker’s web site in a new tab. Please scroll down to the bottom of the page for the photo gallery, followed by the Huffler 35 video. Huffler 35 from Simon Cox on Vimeo.